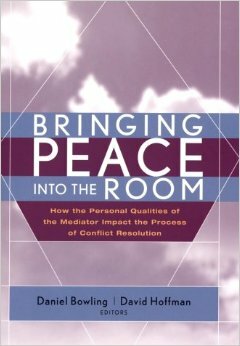 Bringing Peace Into the Room examines the personal qualities that make a mediator effective. The eminent authors of this volume go beyond traditional descriptions of academic training, theoretical orientation, and refinement of technique to confront issues related to personal temperament and the crucial psychological, intellectual and spiritual qualities of the mediation professional- qualities that are often the most potent elements of successful mediation. In this comprehensive resource, Daniel Bowling and David Hoffman bring together a stellar panel of practitioners, academics, teachers, and trainers in the field- Michele LeBaron, Kenneth Cloke, Robert Benjamin, Don Saposnek, Sara Cobb, Peter Adler, Jonathan Reitman, Lois Gold, Marvin Johnson, and others- ?who share their personal experiences as mediators. Each contributor demonstrates that at the very heart of conflict resolution is the subtle interaction between the parties and the mediator's personal and authentic style.